Click the button below to add the AWR3 - 1 Gallon to your wish list. 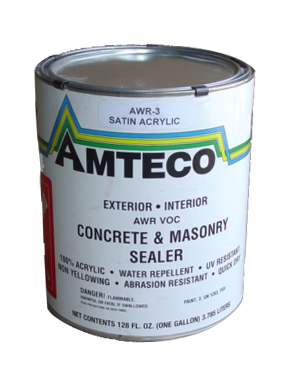 A water clear 100% acrylic solution surface lacquer sealer for exterior and interior use on concrete, masonry, and aggregate surfaces. 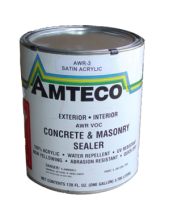 The resin has superior ultra violet light resistance and does not yellow on exterior exposures. It is specifically designed for ease of maintenance due the ability to redissolve into itself when recoating after aging. The film has superior resistance to traffic and most water and oil based common chemicals. Properly sealed surfaces have excellent food stain resistance. Available in satin, gloss, and black (for asphalt). Decorative and uncolored concrete aggregate finishes, terracotta tiles, concrete, interior and exterior concrete floors, bricks, driveways, precast exterior aggregate construction panels, patio blocks, asphalt, stone, cast limestone sandstone and stucco.